When Artists for Soup (AfS) was getting started, we needed all the help we could get, and FUPROSOMUNIC, also known as Solar Women of Nicaragua, was there when we needed mentoring. Truth is, Solar Women of Nicaragua is still helping us find our way, and I’ve been thinking about them because they’ve been nominated for an award by Water, Air, and Food Awards, WAFA, a Danish organization that “targets breakthrough low-tech, high impact, local innovations for clear water, clean air and nutritious food.” I voted for them at http://www.wafaward.org/polling/. And it occurred to me that if I told AfS supporters a little about their work, some of you might want to vote for them too. Voting tip: Once registered on WAFA website (above), please go to the category of “Air” and select Solar Women of Nicaragua. It doesn’t take long but it may take a few tries. Solar Women of Nicaragua works with Nicaraguan women to improve the lives of their families by promoting the use of solar ovens and complementary wood-conserving stoves, solar food dryers and dehydrators, water purification technology, and small-scale solar electrification of family homes. During the current political crisis, they are focused on the bio-intensive method of home gardening as a way of improving nutrition. My first encounter with the generosity of the Solar Women of Nicaragua was on a field trip with a La Paz Centro gardening group, a project AfS supported in our first year. We travelled to Catarina and the farm of the women’s solar organization on a day when mangos were at their peak. The half-mile walk into their solar demonstration area was lined with mango trees. Unbroken mangoes dotted the dirt path. Almost every one of our chins soon had mango juice on it, and when the women at Solar Women of Nicaragua welcomed us, they invited us to keep enjoying mangoes while we learned about their work. 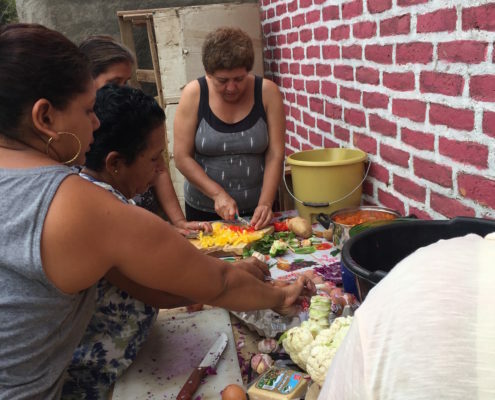 In 2016, AfS asked Solar Women of Nicaragua to come to La Paz Centro to lead a week-long workshop on making solar ovens. The workshop included fifteen low-income women involved in our community and family bio-intensive gardening projects. A team of three women with power tools and excellent teaching abilities ran the workshops. The solar teachers got up early each day to organize the women from La Paz Centro, who ranged in age from 20 to 65. The workshop combined daily collaboration in building fifteen solar ovens made from wood and metal, lessons in ecology, conservation, and nutrition, group cooking, group meals prepared in completed solar ovens, and lots of laughter. 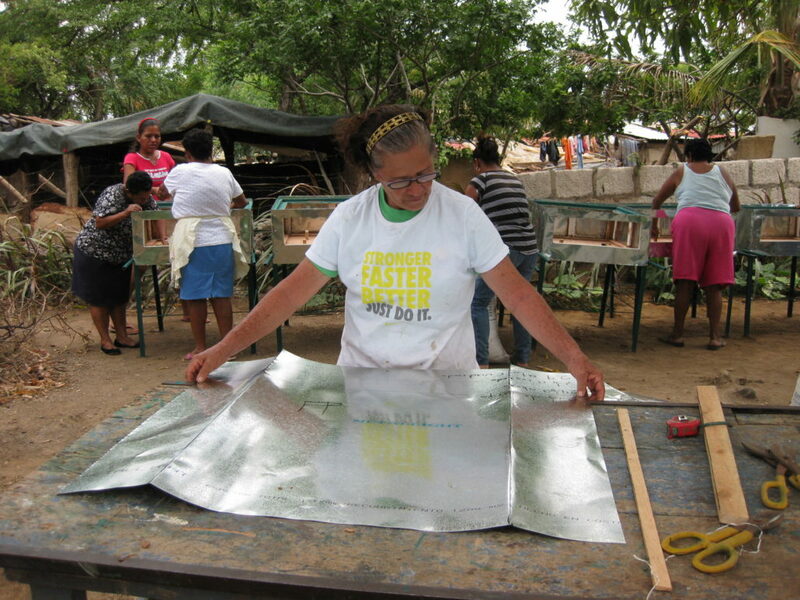 Our work with Solar Women of Nicaragua has been consistently helpful. Mercedes’ Alvarez, who co-founded Solar Women of Nicaragua in 2004, has worked with impoverished women in Nicaragua to build more than 900 solar ovens that lessen environmental degradation and improve health (wood smoke is a leading cause of lung disease in the region). The organization also works with solar dehydrators to dry fruits and teas, providing a source of income for rural women. When Mercedes Alvarez agreed to help AfS with building and learning to use our first batch of ovens in 2016, we saw investment in these stoves primarily as a way to reduce the carbon footprint of cooking and improve health. Since then, we’ve learned solar ovens can give far more hours in the day for creativity, gardening and relaxation. 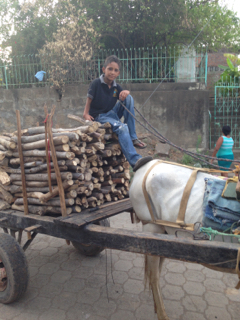 In Nicaragua, many people still cook indoors with firewood, a method that not only leads to deforestation but also erodes the health of people who live in the house. This method of cooking with firewood has been called “the killer in the kitchen” because of chronic illnesses caused by toxic pollution. Acute respiratory illness, pneumonia, and cancer are all linked to breathing toxic smoke from an indoor fire. Although the pursuit of health and conservation would be reason enough to adopt solar ovens, the other compelling benefit of solar ovens is that women who cook with firewood typically spend 5 to 7 hours a day over a fire, and this doesn’t include the hours spent collecting firewood. 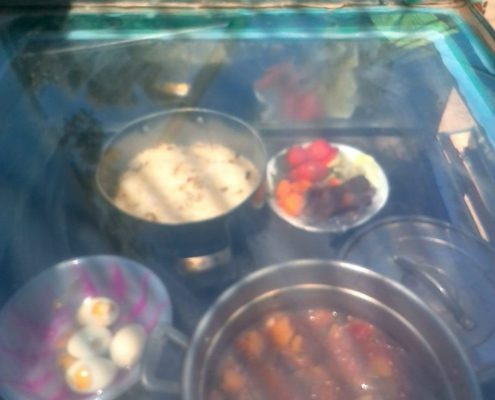 Cooking with a solar oven reduces the amount of time devoted to food preparation to an hour because the food gets prepared once in the morning, cooks for three to five hours unmonitored, and can be kept warm without burning throughout the day. 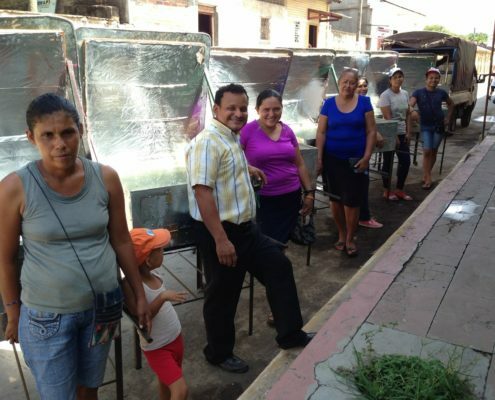 As time passed, AfS built more solar ovens by employing a local carpenter and then Solar Women of Nicaragua teachers returned for three days to help fine tune the stoves and show participants how to use them. One community group in the very poor settlement of El Quilombo used two stoves at their community center in an AfS youth program on cooking. AfS worked with teens who made and posted videos of themselves teaching others how to cook new recipes, including banana bread, lentil dumplings, chickpea rice, and eggplant stew. Solar Women of Nicaragua has taught me that shifting environmental and human health practices in communities requires patience and flexibility. For example, when the skies are overcast, you can excavate a new bed in your garden and eat the ripe avocados instead of trying to cook in your solar oven. Ideally, for times when the rains make solar cooking impossible, a family can save for a high efficiency stove that uses 50% less firewood and takes the smoke out of the house. Being able to move between productive areas of work in response to the constraints of economy, climate or political reality, is the key to success in this kind of work, and Solar Women of Nicaragua is a model of flexibility and accomplishment in a tumultuous time. While anticipating the realities of climate change, they help women imagine the daily actions and skills that address the immediate challenges to good health, and they help to build a stronger local economy. Their determination inspires joy. 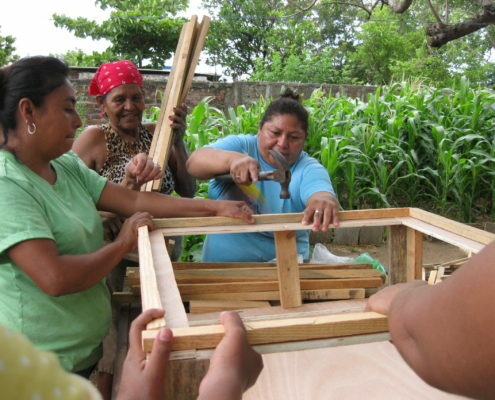 I encourage you to vote for Solar Women of Nicaragua before August 24th at http://www.wafaward.org/polling/.